So should Paul Verhoeven take this as an insult or a compliment? Two of his best known movies, Total Recall and Robocop, are currently at different stages of being remade and now one of his lesser known but – in my opinion – most fun films, Starship Troopers is next. Vulture reports Fast and Furious producer Neil Moritz has hired Thor and X-Men First Class screenwriters Ashley Edward Miller and Zack Stentz to write a new adaptation of the classic sci-fi novel by Robert A. Heinlein. The original film, released in 1997, was a moderate theatrical success but lives on in the hearts of its fans (myself included) and in numerous direct to DVD sequels. A new animated film, Starship Troopers Invasion, from the acclaimed director of Appleseed Shinji Aramaki, will be released next year. That’s all well and good, but what exactly will this reboot consist of? We ask those questions after the jump. Vulture reported the news of the reboot but, other than the producer and screenwriters, didn’t have any additional news. So, instead of leaving you hanging, here are three big questions I’d love answered followed by some of my thoughts. 1. Will they go back to the Heinlein source material or draw from Verhoeven’s film? Heinlein’s book is cold and calculated while Verhoeven’s take on the material was bombastic and satirical. I’d imagine Sony thinks part of the reason the first film wasn’t a massive, massive hit was because of the original’s tongue-in-cheek tone. Knowing that, this one will probably be a lot more clinical and serious. 2. Will this reboot feature power armor, a major element of the novel that was removed from the movie? In the book, power armor is a very important part of the story. It’s basically a suit all members of the Mobile Infantry wear which has incredibly abilities including limited flight. Verhoeven wanted to include this in his movie but couldn’t afford it, even with a massive budget. One would imagine it’s much cheaper to make people fly these days so, yes, it will probably in the movie. 3. Seriously, what’s the point of this remake anyway? When I saw Starship Troopers in 1997, it blew my mind. It was one of my favorite films of that year and to this day I revisit it every few months, whether it be on TV or Blu-ray. The whole thing is incredibly exciting, incredibly smart and incredibly funny. If anything, I’d love to see where the film goes at the end because it leaves us with an open ending. But, even today, Starship Troopers looks great, holds up and has loyal fans. I’m very curious to hear what this new version of the film can possibly bring that the old one doesn’t. 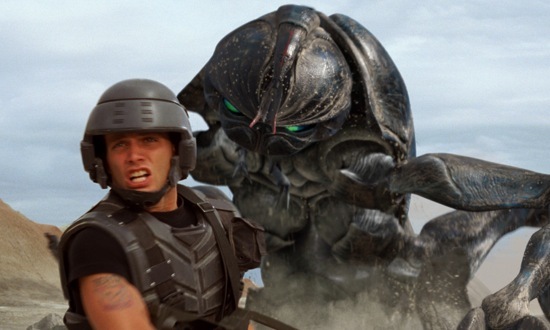 What are you thoughts on a Starship Troopers remake?